AGCO, Your Agriculture Company (NYSE:AGCO), a worldwide manufacturer and distributor of agricultural equipment, reported net sales of approximately $2.0 billion for the first quarter of 2018, an increase of approximately 23.3% compared to the first quarter of 2017. Reported net income was $0.30 per share for the first quarter of 2018, and adjusted net income, excluding restructuring expenses, was $0.35 per share. These results compare to a reported net loss of $0.13 per share and adjusted net loss, excluding restructuring expenses and a non-cash expense related to waived stock compensation, of $0.02 per share for the first quarter of 2017. Excluding favorable currency translation impacts of approximately 9.4%, net sales in the first quarter of 2018 increased approximately 14.0% compared to the first quarter of 2017. Excludes currency translation impact. See reconciliation in appendix. (2) Based on company estimates. AGCO’s North American net sales increased 29.6% in the first three months of 2018 compared to the same period of 2017, excluding the positive impact of currency translation. Precision Planting, which was acquired in the fourth quarter of 2017, contributed sales of approximately $61.2 million in its seasonally strong first quarter. Excluding the impact of acquisitions and currency translation, sales grew approximately 11.7% compared to the first quarter of 2017. The largest increases were in mid-range and high horsepower tractors and sprayers. Income from operations for the first three months of 2018 improved approximately $23.8 million compared to the same period in 2017. The benefit of the Precision Planting acquisition and higher sales and production volumes produced most of the increase. Net sales in the South America region decreased 13.2% in the first three months of 2018 compared to the first three months of 2017, excluding the impact of unfavorable currency translation. Significant sales decreases in Argentina and Brazil produced most of the decline. Income from operations dropped approximately $19.0 million for the first three months of 2018 compared to the same period in 2017. Lower sales and production volumes, the impact of material cost inflation and the costs associated with transitioning to the new products with tier 3 emission technology all contributed to the decrease in income from operations. AGCO’s EME net sales increased 14.3% in the first three months of 2018 compared to the same period in 2017, excluding favorable currency translation impacts. Acquisitions benefited sales by approximately 3.8% during the first three months compared to the same period last year. Higher sales in Germany, the United Kingdom and France produced most of the increase. Income from operations improved approximately $35.4 million for the first three months of 2018, compared to the same period in 2017, due to the benefit of higher sales and margin improvement partially offset by higher engineering costs. Asia/Pacific/Africa net sales increased 12.4%, excluding the positive impact of currency translation, in the first three months of 2018 compared to the same period in 2017. Higher sales in Australia and China produced most of the increase. Acquisitions benefited sales by approximately 3.4% during the first three months of 2018 compared to the same period last year. Income from operations improved approximately $2.6 million in the first three months of 2018, compared to the same period in 2017, due to higher sales and production levels. AGCO’s net sales for 2018 are expected to reach $9.3 billion reflecting improved sales volumes, positive pricing as well as acquisition and foreign exchange impacts. Gross and operating margins are expected to improve from 2017 levels due to higher sales as well as the benefits resulting from the Company’s cost reduction initiatives, partially offset by increased engineering expenses. Based on these assumptions, 2018 earnings per share are targeted at approximately $3.65 on a reported basis, or approximately $3.70 on an adjusted basis, which excludes restructuring expenses. AGCO will be hosting a conference call with respect to this earnings announcement at 10:00 a.m. Eastern Time on Tuesday, May 1, 2018. The Company will refer to slides on its conference call. Interested persons can access the conference call and slide presentation via AGCO’s website at www.agcocorp.com in the “Events” section on the “Company/Investors” page of our website. A replay of the conference call will be available approximately two hours after the conclusion of the conference call for twelve months following the call. A copy of this press release will be available on AGCO’s website for at least twelve months following the call. Statements that are not historical facts, including the projections of earnings per share, sales, industry demand, market conditions, commodity prices, currency translation, farm income levels, margin levels, investments in product and technology development, new product introductions, restructuring and other cost reduction initiatives, production volumes, tax rates and general economic conditions, are forward-looking and subject to risks that could cause actual results to differ materially from those suggested by the statements. The following are among the factors that could cause actual results to differ materially from the results discussed in or implied by the forward-looking statements. A majority of our sales and manufacturing take place outside the United States, and, as a result, we are exposed to risks related to foreign laws, taxes, economic conditions, labor supply and relations, political conditions and governmental policies. These risks may delay or reduce our realization of value from our international operations. Most retail sales of the products that we manufacture are financed, either by our joint ventures with Rabobank or by a bank or other private lender. Our joint ventures with Rabobank, which are controlled by Rabobank and are dependent upon Rabobank for financing as well, finance 40% to 50% of the retail sales of our tractors and combines in the markets where the joint ventures operate. Any difficulty by Rabobank to continue to provide that financing, or any business decision by Rabobank as the controlling member not to fund the business or particular aspects of it (for example, a particular country or region), would require the joint ventures to find other sources of financing (which may be difficult to obtain), or us to find another source of retail financing for our customers, or our customers would be required to utilize other retail financing providers. As a result of the recent economic downturn, financing for capital equipment purchases generally has become more difficult in certain regions and in some cases, can be expensive to obtain. To the extent that financing is not available or available only at unattractive prices, our sales would be negatively impacted. We have experienced substantial and sustained volatility with respect to currency exchange rate and interest rate changes, including uncertainty associated with the Euro, which can adversely affect our reported results of operations and the competitiveness of our products. Further information concerning these and other factors is included in AGCO’s filings with the Securities and Exchange Commission, including its Form 10-K for the year ended December 31, 2017. AGCO disclaims any obligation to update any forward-looking statements except as required by law. AGCO (NYSE: AGCO) is a global leader in the design, manufacture and distribution of agricultural solutions and supports more productive farming through its full line of equipment and related services. AGCO products are sold through five core brands, Challenger®, Fendt®, GSI®, Massey Ferguson® and Valtra®, supported by Fuse® precision technologies and farm optimization services. Founded in 1990, AGCO is headquartered in Duluth, GA, USA. In 2017, AGCO had net sales of approximately $8.3 billion. 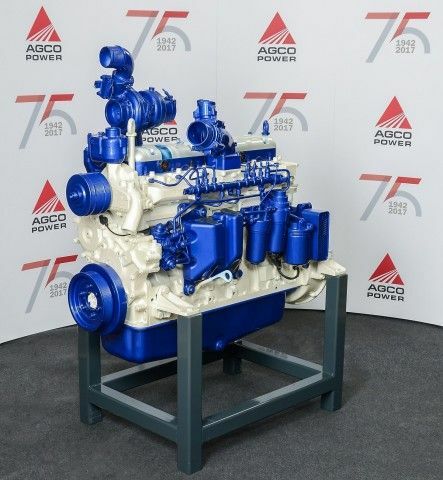 For more information, visit http://www.AGCOcorp.com. For company news, information and events, please follow us on Twitter: @AGCOCorp. For financial news on Twitter, please follow the hashtag #AGCOIR. From 2014 through 2018, the Company announced and initiated several actions to rationalize employee headcount at various manufacturing facilities and administrative offices located in Europe, South America, China and the United States in order to reduce costs in response to softening global market demand and lower production volumes. The aggregate headcount reduction was approximately 3,370 employees between 2014 and 2017. The Company had approximately $10.9 million of severance and related costs accrued as of December 31, 2017. During the three months ended March 31, 2018, the Company recorded an additional $5.9 million of severance and related costs associated with further rationalizations associated with the termination of approximately 110 employees, and paid approximately $3.7 million of severance and associated costs. The remaining $13.2 million of accrued severance and other related costs as of March 31, 2018, inclusive of approximately $0.1 million of positive foreign currency translation impacts, are expected to be paid primarily during 2018. The Company has accounts receivable sales agreements that permit the sale, on an ongoing basis, of a majority of its wholesale receivables in North America, Europe and Brazil to its U.S., Canadian, European and Brazilian finance joint ventures. As of both March 31, 2018 and December 31, 2017, the cash received from receivables sold under the U.S., Canadian, European and Brazilian accounts receivable sales agreements was approximately $1.3 billion. Losses on sales of receivables associated with the accounts receivable financing facilities discussed above, reflected within “Other expense, net” in the Company’s Condensed Consolidated Statements of Operations, were approximately $7.8 million and $8.3 million during the three months ended March 31, 2018 and 2017, respectively. The Company’s finance joint ventures in Europe, Brazil and Australia also provide wholesale financing directly to the Company’s dealers. As of March 31, 2018 and December 31, 2017, these finance joint ventures had approximately $47.8 million and $41.6 million, respectively, of outstanding accounts receivable associated with these arrangements. In addition, the Company sells certain trade receivables under factoring arrangements to other financial institutions around the world. This earnings release discloses adjusted income from operations, adjusted net income (loss) and adjusted net income (loss) per share, each of which exclude amounts that are typically included in the most directly comparable measure calculated in accordance with U.S. generally accepted accounting principles (“GAAP”). A reconciliation of each of those measures to the most directly comparable GAAP measure is included below. (1) Net income (loss) and net income (loss) per share amounts are after tax. (2) The restructuring expenses recorded during the three months ended March 31, 2018 and 2017 related primarily to severance costs associated with the Company’s rationalization of certain U.S., European and South American manufacturing operations and various administrative offices. (3) The Company recorded approximately $4.8 million of accelerated stock compensation expense during the three months ended March 31, 2017 associated with a waived award declined by the Company’s CEO. (1) Net income per share amount is after tax. (2) The above reconciliation reflects adjustments to full year 2018 targeted net income per share based upon restructuring expenses incurred during the three months ended March 31, 2018. Full year restructuring expenses could differ based on future restructuring activity.